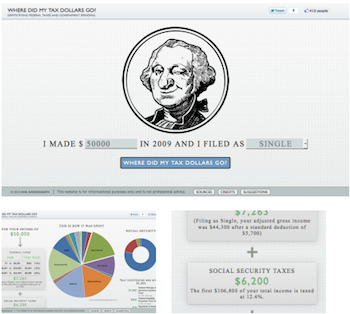 April 18, 2011, 9 a.m.
By Megan Garber @megangarber April 18, 2011, 9 a.m.
Today, tax day, Google is announcing the winner of that contest: Anil Kandangath, whose “Where Did My Tax Dollars Go?” illustrates users’ personal contributions to the federal budget through a combination of text and charts and interactive elements that work together to create, believe it or not, a narrative arc. The site, in encouraging a kind of linear movement-through-data on the part of the user, emphasizes both exploration and explanation. Kandangath had been thinking of doing a tax-related dataviz project even before he found out (through Reddit) about Google’s contest; conversations with his friends (one of whom was sure — sure! — that 40 percent of his salary was going to Uncle Sam) had convinced Kandangath that “most people, including myself, don’t know how money is spent” when it comes to taxes. Before the contest, though, he’d been lacking a data set that would allow him to create something that would be meaningful because it would also be accurate. So the WhatWePayFor information — which Google required all contest participants to use in their data viz efforts, and which was available to those participants through an API — “was a godsend,” Kandangath says. In fact, the entire contest began with WhatWePayFor, says Jenny Ramaswamy, the Marketing Manager for Google’s Data Arts team. The team saw that site, she told me, “and we thought, ‘Wow, this is really useful. Wouldn’t it be great if we could make that information accessible to a wider audience? '” To do that, Google partnered with Eyebeam, a nonprofit art and technology center that has strong ties to the community of developers who specialize in visualization. They formed a a jury of eleven coders and designers who’d be able to discern the striking and educational projects from the merely striking ones. His goal in creating his visualization, Kandangath says, was to present the data in a compelling enough way that people would actually remember it — the stickiness factor that everyone from engineers to academics to journalists is trying to figure out at the same time. Kandangath’s answer? Narrative. “People remember stories,” he notes. They may not recall individual facts; but when you can craft those facts together in a compelling arc, those facts become part of something more than the sum of their parts: a memorable tale. Even when it’s not rendered in text alone. So Kandangath essentially imposed on himself the task of plotting flat information so that it would come to life via…a plot. Kandangath is planning to put the project on GitHub (at some point — “right now, I’m not prepared to show how ugly it is!”). Future, crowd-improved incarnations of the project could allow users to visualize tax allocations for different years, or to see state data rather than federal, or to see similar breakdowns for other countries. POSTED April 18, 2011, 9 a.m.
Garber, Megan. "“People remember stories”: Meet Anil Kandangath, the winner of Google’s Data Viz Challenge." Nieman Journalism Lab. Nieman Foundation for Journalism at Harvard, 18 Apr. 2011. Web. 20 Apr. 2019. Garber, Megan. "“People remember stories”: Meet Anil Kandangath, the winner of Google’s Data Viz Challenge." Nieman Journalism Lab. Last modified April 18, 2011. Accessed April 20, 2019. https://www.niemanlab.org/2011/04/people-remember-stories-meet-anil-kandangath-the-winner-of-googles-data-viz-challenge/.